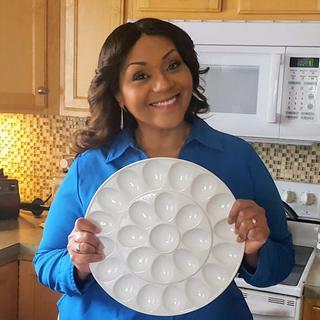 EXCLUSIVE An elegant way to serve deviled eggs and other egg dishes, this serving platter features 24 egg-shaped cavities that prevent rolling as well as a circular central cavity that’s perfect for dipping sauces and garnishes. Classic porcelain cleans up easily in the dishwasher and complements any décor. I didn't realize it was so large and held 2 dozen or so eggs halves, none the less, we love our new platter. In addition to the deviled eggs, we arranged radishes and parsley among the eggs. Very pretty. Our guests devoured the deviled eggs and radishes before I had time to take a photo. The white porcelain egg platter looked very nice on my holiday table. I filled it with deviled eggs and green olives in the center receptacle. I couldn't be more pleased with this purchase! Simplistic yet extremely stylish and functional. Will encourage me to make my popular bacon/Dijon/cayenne diablo eggs more often! Thank you! Basic deviled egg platter in white porcelain. Reasonable thickness so it's not too fragile (although remember it is porcelain). Eggsactly as pictured! ;-) Holds 24 instead of mostly smaller trays. Used it for Easter dinner. Perfect! Have used it a couple of times. So pleased with the outstanding presentation that I ordered another one. Wanted to have a nice platter for deviled eggs. Always wanted a egg platter that didn't looks like an egg. Have always wanted one and this one had places for several deviled eggs, unlike the ones seen before. My husband loves to make deviled eggs, so I thought it would be nice if he had a pretty platter to present the eggs upon. Plus, I enjoy the look of white porcelain. I have been wanting a platter that will hold a dozen eggs. When the family gets together I have to bring the deviled eggs and I didn't have an item to carry them in and this platter looks perfect. Generous capacity and excellent reviews. This uses all 24 egg halves in a dozen hard boiled eggs. Simple design - lets the beautiful eggs take center stage. many eggs will fit, and it looks like the spacing between eggs is larger than other platters. so no bumping unintended ones when reaching in, hopefully. It's the so very practical!! More deviled eggs on one platter in an easy to decorate platter. I needed a serving platter I could use when bringing deviled eggs to a Thanksgiving pitch-in. I also like that it has a center server for garnishes such as capers, caviar, etc. Great sale price, too! easter entertain in new home! Tired of having deviled eggs slide all over a plate. I didn't have one and wanted one and it looked so nice. Christmas present for 23 year old son who makes unbelievably great deviled eggs for his work functions and needs a nice tray. Great Egg Plate and I like better than WS's. My mom asked for a deviled egg plate for Christmas! Porcelain is better than plastic and it's big enough for a large gathering.